Joyce Bedner looks forward to daily visits from her husband, Patrick. Despite living with Alzheimer’s disease, she remembers her husband as well as how much she loves him. “We’ve been together for so long, and we always do things together,” she says. 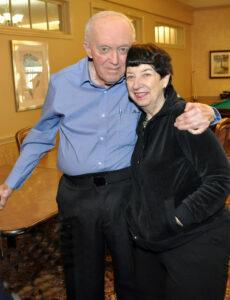 Patrick and Joyce Bedner’s love story continues after 54 years of marriage, despite Alzheimer’s disease. The Bedners were married nearly 54 years ago, and reside at Country Meadows of South Hills of Pittsburgh. Theirs is a beautiful love story that is standing the test of time, as well as their wedding vows. 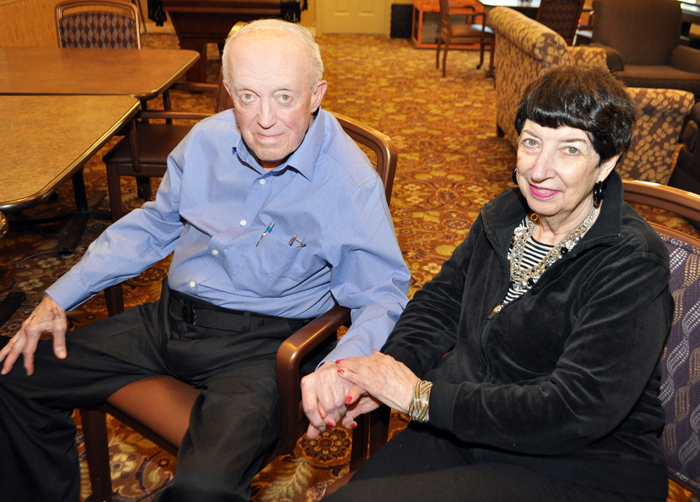 Though they live in separate apartments so each spouse can receive the care he/she needs, the couple makes a point to spend time together nearly every day, and is regularly seen on campus holding hands and enjoying an embrace. Mr. Bedner moved into an apartment in the campus’ Personal Care building just one week after his wife moved into the Connections Neighborhood for persons requiring memory support services. While living in their own home, Mr. Bedner realized that he could no longer provide the care his wife needed for her Alzheimer’s syptoms. He had his own health issues, and after suffering bruises and injuries from falls, he knew it was time to seek help. Mr. Bedner continues. “There’s a story about a man who was rushing to get to another appointment. When asked where he was going, the man said that for five years his wife had Alzheimer’s and hasn’t known who he is. When further questioned why the man continues to visit his wife if she has no idea who he is, the man replies, ‘Because I still know who she is.’ That struck a chord with me,” he says, choking back tears. And this couple is connected. In addition to spending time together every day, Mr. Bedner calls his wife every night just before bed. “I call her to tell her I love her and will see her tomorrow,” he says. While he receives the services he needs, Country Meadows’ co-workers help Mrs. Bedner by providing opportunities for her to participate in brain fitness activities as well as fun and intellectual stimulation to help her maintain the memories she has.